It’s been a “trying” week…. With everything that has happened, I would like to remind everyone to take a moment and remember the important things in you life! Treasure each moment and all the blessings you been given, enjoy the people who make you smile, and above all, feel good about yourself! Life is too short to keep focusing on what you don’t have! via JillCards, LLC – Friendship. via Little Light Studio – Tutorials. On May 22, 2010 I married my best friend in front of 100 of our closest friends and family. It is only through patience, understanding and a lot of time that our families have come to realize just because society says we’re “different” – we love just the same as everyone else, COMPLETELY. I am a control freak and everyone around me knows it. Jill deals with life one moment at a time – I’d much rather have it planned out on my Android with confirmations from all parties involved. I am a Riders Edge instructor at Sauk Prairie Harley-Davidson, Inc. I love the opportunity to help people realize their dreams to ride motorcycles safely, coaching them to succeed and exceed their goals one exercise at a time. I am SO not the creative/talented partner at JillCards, LLC. I am an avid photographer who enjoys capturing wildlife and friends in their natural habitat. Jill can take a simple piece of paper, acid free adhesive (see I’m paying attention!) and make a beautiful Send again greeting card. I am in recovery and have been for a few 24 hours (as we say in the program). Had I continued using, none of what I enjoy today would be my reality. It is only through sobriety that the rest of my life is real. I am the mother to 2 teenagers, My son is 19 and my daughter is 15 – I’m not sure but I think they have completed a foreign language somewhere along the line without me knowing it. UGH – I just don’t get them sometimes – did my parents feel that way? We developed the “Send again” greeting card concept in the fall of 2009. 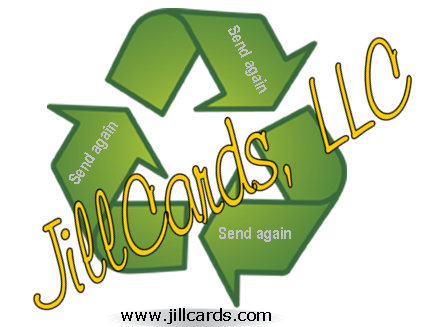 Jill had worked with the idea for years but together we invested time, effort and some money and made JillCards, LLC a reality. We are a small company based in beautiful rural Wisconsin. Our hand-made personalized cards can be sent again to another person, after receiving it. For the recycled concept, we use everything from used greeting cards, old calendars, discarded magazines, our pictures, your own photographs, scrapbook materials; just about anything we can get our hands on. We recycle each card into a unique personal treasure! To “Send again”, simply remove the message tag on the card backside, and replace it with the already used message tag on the inside of your card. Now, you are ready to write your own heartfelt message, and “Send again”. It’s like re-gifting a greeting card! We encourage anyone to submit their own photos for an even more personal touch. Jill and I are almost complete opposites. I previously mentioned our different approaches to life, but that’s only the beginning. Jill comes from a large family – mine was small (2 daughters), she needs lots of sleep and until my recent back surgery – I needed very little and worked 14+ hours per day most of the year, she’s creative and has a can do anything attitude – I don’t feel very creative and can get frustrated and give up easily. Now all the stuff we share – 1st and foremost our love for each other and everyday living, side-by-side, JillCards – the home business we started in the fall of ’09, together we have 5 kids all of which are VERY different, we LOVE coffee and have a crazy fun day/night sitting at a coffee shop with our laptops, after she learned to ride motorcycles – she became almost as addicted to Harley-Davisons as I am, we love to laugh with each other doing something OR absolutely nothing but giggling like little girls, we also have some of the best parents and best friends that anyone could ask for! Thanks for this opportunity to think a little deeper in 2011!